CONTENTS: 1. BACKGROUND: Outer Space has no air, but it is not a pure vacuum. There are a lot of particles (mostly Hydrogen atoms) in space, and they might help us travel to the stars. 2. INTERSTELLAR RAMJET: A vast electro-magnetic grid can "scoop" up these particles for proton-proton (p-p) fusion reactions to further enhance vessel's acceleration. Dr. Robert Bussard conceived the interstellar ramjet and published a paper in 1960. 3. CNO CATALYTIC: Dr. Daniel Whitmire followed up with his own paper in 1975 and introduced some relevant concepts such as the Carbon-Nitrogen-Oxygen (CNO) catalytic fusion process, interstellar drag and ionization methods. 4. RAMJET EVOLUTION: During the lengthy cruise period between acceleration and deceleration powered by ship borne particle accelerators, we might learn to put that time to better use by learning to augment cruise speed via fusion of collected interstellar particles. This learning curve would increase over time due to experience from many interstellar voyages. Outer space is not a perfect vacuum; instead, it is a tenuous plasma awash with charged particles, electromagnetic fields, and the occasional star. Outer space has very low density and pressure, and is the closest physical approximation of a perfect vacuum outside a high tech lab. However, no vacuum is truly perfect, not even in interstellar space, where there are still a few hydrogen atoms per cubic centimeter. Astrophysicists use number density (n) to describe these environments, in units of particles per cubic centimeter. Bussard ramjet uses enormous electro-magnetic fields (hundreds of kilometers in diameter) as a ram scoop to collect and compress hydrogen from the interstellar medium. Bussard’s original design envisaged a large cone shaped structure “scooping up” available nucleons (proton/neutron) . However, typical regions of interstellar space might have only 1 nucleon per cubic centimeter. If so, the ramjet scoop must sweep 1.67×1024 cubic cm (1.67×109 cubic km) of space to collect one gram of hydrogen. If vessel's scoop has a "mouth" of 100 km radius, and it cruises at 60% light speed (.6c) between two stars; it takes 17 seconds for the vessel to collect one gram of Hydrogen (assume perfect efficiency). Vessel's high speed (perhaps 60% light speed, .6c.) forces collected particles into a progressively constricted magnetic field, compressing it until thermonuclear fusion occurs. Original proposal calls for magnetic field to use fusion energy as rocket exhaust; HOWEVER, TE proposes energy for strictly internal use during the vessel’s multiyear, cruise phase. a) Accelerate at g-force for a duration (tAcc) to achieve a reasonable cruise speed yet consume a practical portion of onboard fuel. EXAMPLE: In previous work, Thought Experiment (TE) postulates that after one year (365.25 days) of g-force propulsion, Earth observer would measure vessel's velocity of about 65% light speed (.65c) and distance of about .38 Light Years (LY). TE further postulates that a capable vessel could achieve this with fuel equal to about 17% of the vessel's original Gross Weight (GW0). Assume exhaust particle velocity of .99c. c) Cruise for most of the flight at constant speed between the acceleration and deceleration phases of flight. NOTE: Without g-force propulsion, vessel simulates Earth gravity via centrifugal force by spinning vessel's habitat component about its longitudinal axis. EXAMPLE: For a trip from Sol to Alpha Centauri (distance = 4.3 LY), cruise distance is 4.3 LY - .38 LY - .38 LY = 3.54 LY. Earth observers measure a cruise duration of 3.54LY ÷ .65c = 5.55 years, a long time to power ship’s internal systems with only stored fuel. Ramjet augments on board fuel by collecting particles (mostly nucleons) from the interstellar medium. The captured particles go to a nuclear fusion reactor to supply energy for internal use. Bussard's PPI chain for fusing hydrogen could be much quicker; fortunately, there is a viable alternative. Whitmire proposed a proton burning catalytic cycle. The best known catalytic cycle is the Carbon-Nitrogen-Oxygen (CNO) Bi-Cycle in sufficiently hot main sequence stars. The catalyst “fuel” may be carried on board the ship since it will not deplete; however, the ultimate source of energy is still the interstellar hydrogen. The slowest link in CNO process is much faster than the fastest link in the PPI cycle. 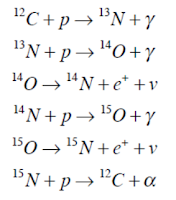 The entire CNO cycle is 100 million times faster than the entire PPI chain. DRAG: Interstellar drag is momentum loss to the interstellar medium. 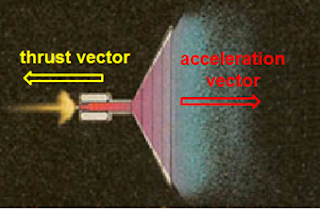 Ship’s magnetic field is coupled with the ship; so, some protons will inevitably collide with the field (coupled to the ship) to impede ship’s acceleration (i.e., drag). Neutral particles (neutrons as well as complete H atoms) will most likely pass unhindered through the mag field with no drag. However, "interstellar drag" might result from mag field's interaction with H ions. Mag field's overall positive charge should repel all "ionized" H atoms without electrons(i.e., "protons") back toward center of field to eventually "funnel" all protons vessel's fusion reactor. Numerous inevitable "bounces" might cause some drag. Any such drag will detract from forward momentum in same manner as friction slows an automobile at a constant speed. IONIZATION: Spray approaching hydrogen atoms with a laser beam to "ionize" them. Resulting protons will more readily react with a powerful magnetic field which extends far beyond the vessel's physical structure. To ionize approaching interstellar Hydrogen atoms, shine lasers into the grid volume forward of ramjet. 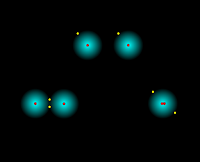 It takes only about 13.6 eV to ionize a single hydrogen atom; in return, the new ion potentially provides about 1 MeV from the subsequent nuclear reaction. Hence, it might be feasible for the ship to power the laser's ionization effort. The laser process must be incredibly efficient. For every laser packet which fails to impact an H atom, 13.6 eV of wasted photons travel out of the scoop volume into the universe. The laser process must be nonredundant. If an ion receives multiple shots of 13.6 eV, the extra energy will likely sweep it out of the ramjet’s scoop volume and not funneled into the ship's fusion reactor. As humanity does more interstellar flights, we'll get smarter in implementing the "ramjet" concept. Perhaps following phases describe how this might happen. created from 9 years of WMAP data. PHASE 0: Constant Cruise With No Collected Particles. For initial voyages to neighboring stars, assume ramjet to be in the planning stage. This would be good time to collect data to validate particle densities throughout the flight. Cosmic Microwave Background (CMB) compels one to conclude that interstellar space is not an absolute vacuum. If there were no particles in space, we could not precisely measure the CMB's variation which has been measured ubiquitously throughout the entire sky. Thus, Thought Experiment (TE) assumes the interstellar particles are there. PHASE 1: Limited Collection With No Propulsion. Use a small magnetic grid to collect particles for proton-proton interaction (PPI) where Hydrogen nucleons fuse to form Helium nucleons. Such a fusion reactor might power on-board functions such as communication, life support, and of course the electromagnetic "collection" grid which funnels the particles to the vessel's fusion. This phase would also have to overcome "drag" due to incident protons impacting the grid. This phase would benefit from even the worst case scenario. Worst Case Scenario: Assume one H atom per cubic cm (cc), a magnetic grid of one km radius and vessel's cruise speed of 60% light speed (.6 c) achieved after 350 days of g-force acceleration. Simple calculations indicate a max collection less than .001 gms of Hydrogen per second. At 86.4 gms of hydrogen per day, perhaps, this is enough to augment vessel’s on-board power. PHASE 2: Slight acceleration above cruise speed. 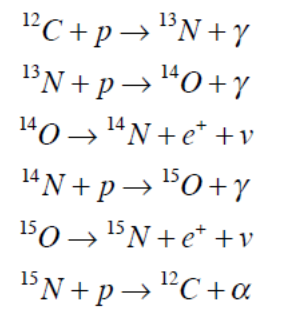 Use a larger magnetic grid to collect particles for Carbon-Nitrogen-Oxygen (CNO) catalytic process to greatly expedite fusion of Hydrogen nucleons to form Helium. (Experts claim that the CNO process could be more than 100 million times faster than the PPI process.) Such a fusion reactor could augment the vessel's cruise speed with some limited acceleration. Vessel would also have to provide ionization methods to greatly increase percentage of charged particles inside the collection area; recall that magnetic grid works best on charged particles. This phase would benefit most from the following, best case scenario. Best Case Scenario: Assume ten H atoms per cubic cm (cc), a magnetic collection area of 100 km radius and a cruise speed of 86.6% light speed (.866 c) achieved after much more than a year of g-force acceleration. Simple calculations indicate a max collection of about 135 gms of Hydrogen per second, a reasonable amount. Even better, relativistic effects should double the particle mass for a collected mass of about 270 gms of H per sec. PHASE 3: G-force throughout cruise via non-propulsive means. CONCLUSION: Even the extreme "best case" falls far short of providing enough momentum to continue 1g travel during cruise phase.RECALL: Typical interstellar vessel is likely several 100 thousand metric tonnes of mass; they would need kilograms (kg) of exhaust particles for each second of 1-g propulsion. However, 270 grams of H particles per second might suffice to "augment" cruise speed by perhaps .1 g, a significant increase. During this augmented cruise, vessel occupants could still enjoy Earth like gravity via centrifugal force from spinning about longitudinal axis. Improve Efficiency. As ramjet's cruise speed increases, the grid sweeps more interstellar volume to collect more particles. 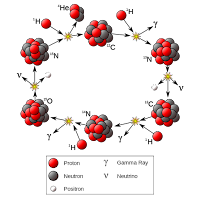 Also, as ionization method improves, more particles become ions to more readily fuse to produce more energy. Thus, grid size can decrease, and less power is needed to make/maintain; thus, more power used for propulsion and less power for grid. 1. Power Requirements. The scoop's magnetic field requires considerable power as does the ionizing laser. BACKGROUND: TE interstellar vessel uses particle accelerator to attain 60%c after 350 days of g-force acceleration. If vessel stops propulsion at that point, vessel cruises at 60%c until it starts decelerating at 350 days prior to destination. However, the interstellar ramjet concept works best with an minimal speed of 60% light speed (.6c) to collect sufficient interstellar particle mass per second for propulsion purposes. Thus, ramjet operation might be feasible during cruise. EQUIVALENCE (human feels Earth like gravity) is still mostly provided by centrifugal force by habitat’s longitudinal spin. I.e., very little equivalence provided by .1g (or less) propulsion. One tenth gravity increases vessel velocity a significant amount. Crude approximationsindicate one year of 0.1g propulsion increases vessel’s relative velocity to 10%c. On board vessel, observer measures velocity increasing from zero to 10%c. Earth borne observer measures velocity increasing 10% of remainder (R) between vessel velocity, V, and c. In this case, R is 40%c (100%-60%), and 10% R is 4%c; thus, v increases from 60%c to 64%c. On board vessel, observer again measures velocity increasing from zero to 10%c. Earth borne observer measures velocity increasing 10% of remainder (R) between vessel velocity, V, and c. In this case, R is 36%c (100%-64%), and 10% R is 3.6%c; thus, v increases from 64%c to 67.6%c. THEREFORE, slowdown point must be carefully recalculated to reflect increased cruise velocity attained via ramjet. AXIOMATIC: After ramjet augmentation during cruise phase, g-force deceleration duration will significantly exceed that of g-force acceleration. R obert W. Bussard (August 11, 1928 – October 6, 2007) was an American physicist who worked primarily in nuclear fusion energy research. He received the Schreiber-Spence Achievement Award for STAIF-2004. He was a fellow of the International Academy of Astronautics. In 1960, Bussard conceived the Bussard ramjet, an interstellar space drive powered by hydrogen fusion using hydrogen collected with a magnetic field from the interstellar gas. Due to high-energy particles throughout space, much of the interstellar hydrogen exists in an ionized state (H II regions) that can be manipulated by magnetic or electric fields. In the early 1970s, Dr. Bussard became Assistant Director under Director Robert Hirsch at the Controlled Thermonuclear Reaction Division of what was then known as the Atomic Energy Commission. Bussard and Hirsch founded the mainline fusion program for the United States: the Tokamak. In 1984 with his wife, Dolly H. Gray, Bussard co-founded a company, Energy Matter Conversion Corporation (EMC²), to exploit a new method of inertial electrostatic confinement fusion. 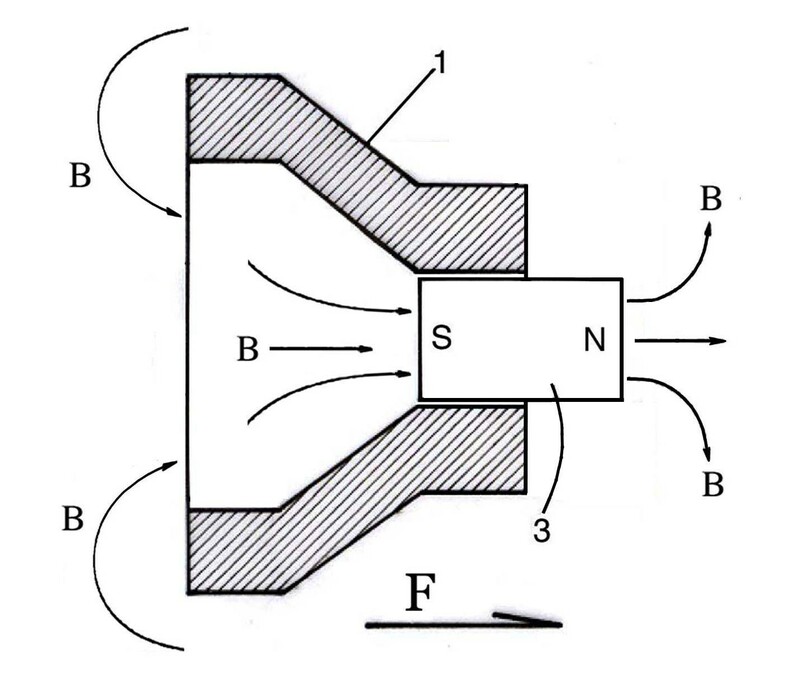 Bussard’s Polywell is a new type of gridless IEC fusor. He built and tested 15 experimental devices from 1994 through 2006 when funding ran out. During 2006 and 2007, Bussard sought the large-scale funding necessary to design and construct a full-scale Polywell fusion power plant. Unfortunately, the relevant line item from US Navy’s FY2006 budget was zero-funded. In spite of denying him funds for further research, the Navy embargoed his Polywell work in lieu of funds previously paid. June 23, 2006. Bussard bravely defied the U.S. Navy's embargo of his research publications by providing details of his breakthrough and the circumstances surrounding the end of his Navy funding in a letter to the James Randi Educational Foundation Internet Forum. October 2-6, 2006. Bussard further defied the U.S. Navy's embargo by reviewing his historic work at the 57th International Astronautical Congress. Throughout the rest of his life, Dr. Bussard continued to present his IEC fusion research at several venues. Bussard died from lung cancer on October 6, 2007 at age 79. His extremely capable team continues his work. 1. Whitmire recently published findings connecting the undiscovered Planet X to mass extinctions on Earth, (see Phys.org) in the Monthly Notices of the Royal Astronomical Society. Every 27 million years, Planet X passes through a distant Kuiper belt of comets, knocking comets into our solar system, and some comets then smash into the Earth. 2. Orbital Anomalies Indicate an Unknown, Large Planet. Caltch researchers recently found orbital anomalies in the Kuiper Belt, which Whitmire proposes as the source of the mass extinction comet showers. The anomaly points to the presence of an undiscovered large planet that is 10 times the mass of the Earth and also 1,000 times more distant from the sun. The Astronomical Journal. 3. Is Brown's "Planet Nine" the Same as Whitmire’s Planet X? 4. Whitmire Retired from Teaching Astrophysics & Now Teaches Math. Whitmire retired from the University of Louisiana at Lafayette in 2012. In 2013, he began teaching math at the University of Arkansas. At Arkansas, some students cosmetically complain that he isn’t familiar with current tech like Blackboard. However, others point out that he is indeed, a great professor, easy to talk to, and always willing to help his students.